Finding the best ultrasonic diffuser isn’t as easy as it used to be. The many medicinal benefits and allure of their luscious aromas have made essential oils wildly popular these days. As a direct result, essential oil diffusers are ever-evolving in an attempt to keep up with the demand and desires of the users. While the growing myriad of choices you now have is a good thing, finding the best essential oil diffuser can be a bit overwhelming. Since ultrasonic essential oil diffusers are the most versatile and widely used type of diffuser on the market, we’ve sifted through a ton of them for you. In this article, we’ll take a look at our top 15 picks along with their reviews and recommendations. First off, it’s good to know a little about the differences in essential oil diffusers. While a nebulizer diffuser is a small atomizer that sprays out pure essential oil, it can go through oils quickly so it be costly to keep up and covers a limited area so it is best for personal use. An ultrasonic diffuser, on the other hand, is ideal for both large and small spaces. It runs on electricity to create ultrasonic vibrations that release essential oil particles into the air. Especially for beginners, ultrasonic diffusers are a great choice because they are simple to use. Simply measure out some water and essential oil and turn it on. Most have automatic shut offs so you are all set with nothing else to worry about. Whether you are wanting to fill your bathroom with a relaxing scent as you soak in the tub or cover an entire classroom or office area, you are sure to find an ultrasonic diffuser to accommodate your needs. Most devices can handle 200-250 square feet. Larger, more expensive one can even service 500 or as much as 1000 square feet. Ultrasonic diffusers require you to fill a tank with water and essential oil. The frequency in which you want to have to do so will depend on the size unit you choose. Smaller tanks have to refilled more often, generally lasting 4-6 hours. They hold about 70-100 milliliters while larger tanks max out in the neighborhood of 300 milliliters and can go for up to 10 hours. Who wants to be lying in bed, drifting off to sleep a nice, relaxing lavender and chamomile treatment and have to get up just to shut of the diffuser? Or, even worse, what if you get to work and realize you left your unit on? Automatic shut-off features automatically turn the device off when the water level runs out. One amazing feature you will find as you delve into comparing ultrasonic diffusers is that a number of them now come with LED lighting options. Along with setting a mood, like romance or tranquility, colors themselves can be therapeutic. The feature can also serve as a night light. Some units have a single band of color, some change colors automatically, and others allow you to choose your own color. From neon to rainbow soft hues, the possibilities are many. A lot of the units let you choose the degree of brightness too. Controlling the airflow is a popular feature many ultrasonic devices come with. Some units have a remote control but some even have designs that are programmable, perfect for predictable times like meditation sessions or organizing mist settings according to the daily schedule around your home, business, or classroom. So you’re all curled up on the sofa, enjoying the invigorating aromatic mist of your ultrasonic diffuser when you realize your husband will be home soon and for him, a little scent in the air goes a long way. The remote control feature allows you to stay nestled in place while changing the controls of your device. Many allow you to turn the unit off, adjust the lighting, or regulate the mist to flow higher or lower. In choosing our top 15 picks in ultrasonic diffusers, we included different shapes, capacities, and price ranges in the mix. This awesome unit made our cut because it is a diffuser that doubles as a humidifier. 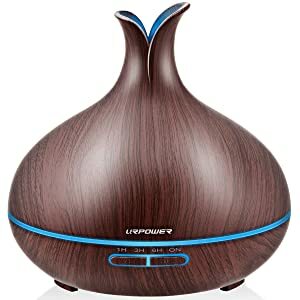 Perfect for times you need to add moisture to the dry air and enjoy aroma therapy benefits at the same time, like in your baby’s nursery, the stylish URPOWER 2nd Generation Ultrasonic Diffuser and Cool Mist Humidifier features a total of 7 colors in the lamp, chose one color or allow it to run through them all. It also has an automatic shut-off or you can program the device to shut down after a certain length of time. The brightness can be dimmed if desired or brightened. There are two adjustable mist settings that allow for intermittent or continual misting. This device has the capacity to run for as many as 6 hours on intermittent mode and up to 3 hours on continual. It holds 100 mL of water (in which several drops of essential oil can be added), making it ideal for small spaces like bedrooms or bathrooms, cubical workspaces at the office, and classrooms. Because of its compact size, you can even take this device with you when you travel and use it in your hotel room, vacation house, cabin, RV, or wherever else you may lodge. Adorably cute, the PureSpa Compact Ultrasonic Diffuser with Ionizer is unbelievable powerful and inexpensive as well. It has all the charm of a pint size package but boasts the features of the big dogs as well. 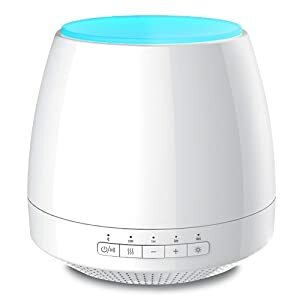 Perfect for beginners who are just getting their feet wet in the wonderful world of essential oils, this diffuser works to cover rooms all the way up to 250 square feet and can last as long as 7 hours at a time. When essential oils are added to the water, it deodorizes, lifts moods, is able to offer medicinal healing, and is quite relaxing as well. The LED lights offer 7 colors which can be played in a mode of cycling or, you can opt for no color at all. The device is noiseless so you can use it at the office, while a child or baby is sleeping, or in most any other area under most any type of condition as well. This unit is one of the easiest to clean. Although it is lightweight, the dimension proportioning of it keeps it upright even if it gets bumped into, a big plus. This good-looking, wood grain Azion URPOWER Essential Oil Diffuser has all the features to make it awesome. It has a 130 mL capacity so it is the perfect size to accommodate a baby’s nursery, child’s room, or any other room or office up to 215 square feet. The mist is adjustable. It can run 3-4 hours on the continual mode setting or can go for more than 6 hours when on the intermittent setting (which is 30 seconds off and 30 seconds on). There are 7 colors of LED light that will go through cycles automatically or can be set to show the color of your choice only. It is powered by USB or batteries so it can even be taken along for use in the car. One of the big perks on this unit is that it carries a 90 day money-back guarantee and also has a full-year warranty. Super affordable, small but potent, this prize is an excellent choice due to portability and versatility. For big power in a small package, this device is sure to please. 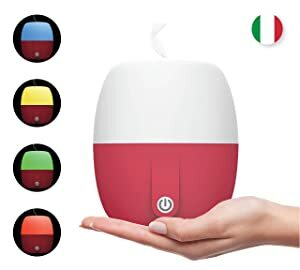 For a touch of Italy, right in your home or office, this Anton Aroma Best Essential Oil Diffuser adds the perfect air and is as beautiful and innovative as the country itself. It releases a fragrant aromatherapy when you add a little essential oil or blend of oils to the water. The capacity of this small but powerful unit is 140 mL. 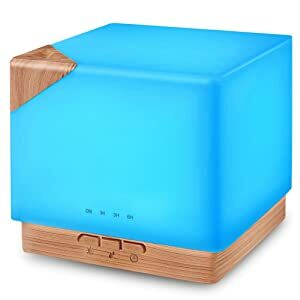 It serves as a humidifier to moisten dry air when no oil is used in the water. Among the features to love about this model is that it comes with an extra-long cord, definitely a huge plus. Designed in Italy, this modern design adds a nice touch to any décor. The whisper-quiet device has a gentle fan inside and is soft rubber on the outside. A time can be set to determine the length of run time and it will automatically shut off after 8 hours or when the water is gone. Covering a room up to 250 square feet, this pint size gem is a powerhouse that can be easily transported from one room to the next, to the office, and can even be taken along on vacation. The color lights change in gentle motions as if they are breathing calmness into your being with hues of yellow, blue, orange, red, pink, purple, green and blue. You can breathe easy because this device is one of the most affordable quality diffusers on the market. 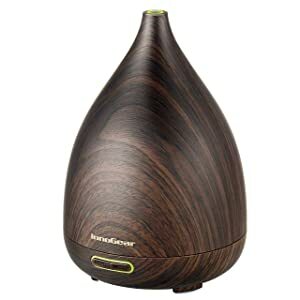 Loved for its versatility due to its compact size and further adored for its 14 color light feature and affordability, this VicTsing Mini Ultrasonic Diffuser and Cool Mist Humidifier comes in a handsome wood grain look that fits into a multitude of decorating schemes. 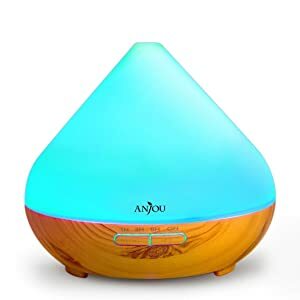 Ideal for use at the spa, during yoga time or even in a small space like the office, this unit serves as both an essential oil diffuser and a cool mist humidifier. The palm-sized device boast an amazing amount of power. It holds 150 mL of water (that can contain several drops of essential oil), so it can run continually for 1-3 hours at a time or up to 4-6 hours on auto-off which will power the unit off when the water is gone. There are 7 different colored lights and each can be set to display in bright or dim so ultimately, there are 14 soothing color options. The lighting effect can double as a night light and for color therapy as well. The diffuser is perfect for most any room including a child’s room or a nursery and is the optimal size for taking along on vacation or wherever else you may roam. 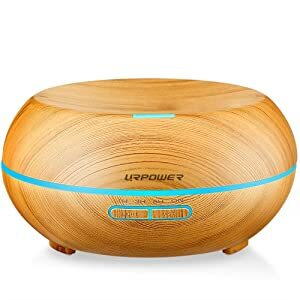 This URPOWER Aromatherapy Essential Oil Diffuser Humidifier with 7 Color LED Lights in wood grain look is not only a fashion statement for the home or office, it sports functions that are threefold – a humidifier, diffuser, and night light. There are seven color options to light up your life that can run simultaneously or, you can choose one color to enhance your mood. With a 200 mL capacity, this device can run on low mist for 6 straight hours. It automatically shuts down when the programmed time of 1,3, or 6 hours is reached or when the water level is depleted. Run on high mist maximize the essential oil disbursement or on low for less flow. You can also use the device without essential oils as a humidifier to moisten dry air which soothes coughing, moistens dry skin, and keeps wood floors from cracking. This unit is ideal for small spaces, like an office or a single room but can also handle a larger space such as a family room or full-size classroom. This InnoGear Vase-Shaped Ultrasonic Diffuser gives you the ultimate of both worlds. It is an essential oil diffuser and/or a humidifier. The 7 color light show calms and relaxes you while you soak up the amazing aroma of the diffuser and can also serve as a night light. You can also choose a single color of light to set your mood. The device features an auto shut-down mode when the water runs out so it is safe, even if you forget to turn it off when you leave home. With a 200 mL water (and oil) capacity, the mist mode is adjustable between intermittent and continuous. It can be run without essential oil to function solely as a humidifier to add moisture to dry air, like in your bedroom or even in a baby’s nursery or child’s room. The whisper-quiet feature is a big plus on this model and it is also BPA free. 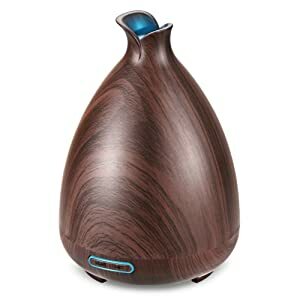 The Zen-style wood grain décor makes this device a nice addition to any home or office and the medicinal and pleasurable functions make it a “must have” for health and relaxation purposes. This translucent, vase-shaped diffuser/ humidifier is an elegant touch to any space in your home, office, or even at the gym or in the spa. The LED lights actually breath, turning from dim to bright in gentle intervals for the ultimate in relaxation therapy. Operating the device is a cinch. Simply press a button to command the lights and the mist levels as well. The unit is so quiet, it doesn’t even make a beep when turned off or on. With a capacity of 200 mL of water and oil, this InnoGear Vase-Shaped Essential Oil Diffuser automatically shuts off when it is out of water so you can rest easy without worrying you forgot to shut it off or fell asleep with it on. The unit is BPA-free and constructed of high quality materials so it is perfect for the nursery, around nursing mothers and for the elderly. 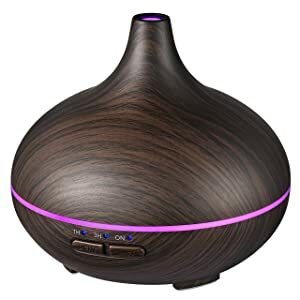 This diffuser doubles as a humidifier when used without essential oil so it moisturizes the air, warding off the dryness that can cause respiratory issues, dry skin and throats, cracking in the floors and walls, and many other problems. There are four modes to choose from and the water tank is easy to clean. The sound of music…that’s what sets this InnoGear Essential Oil Diffuser with Bluetooth Speakers apart from the rest. Music is proven to be very therapeutic so imagine the effects when combined with the medicinal benefits that essential oils bring to the table. With a 200 mL capacity, this diffuser is able to deliver to a bedroom, nursery, office, cubical area, hotel room or small to medium size family area. 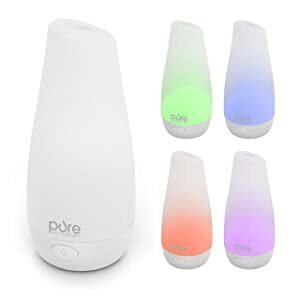 It has a five-in-one multifunction that consists of the Bluetooth 4.2 speaker, a LED 7 light mood setting, essential oil diffuser, fashionable minimalist-style home decoration, and a nightlight too. The misting is adjustable and can be set to run in three different timer modes. It will automatically turn off when the water depletes. The lights can be cycled through or you can choose one to set your mood to. BPA-free, this fine diffuser is the perfect addition to any home or office. 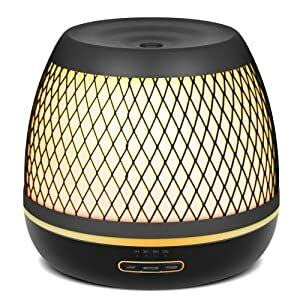 The speakers can fill a large area with sound and the unit itself has can handle diffusing a nice sized area with essential oil mist or you can decline adding oil in for a humidifying effect. This Anjou Aromatherapy Diffuser has a number of features we think you will love. It is handsome indeed with a versatile wood grain look so you’ll be proud to have it in your home or office. It can serve as an ultrasonic essential oil diffuser or can be used without oil for a cool mist humidifier to remedy the symptoms dry air brings. The fact that it holds 300 mL of water (and oil) means it can go up to 8 continuous hours without needing the water refilled. You can also program the unit to go for 1, 3, or 6 hours at a time. It has 7 colors of LED lights that can be streamed or a single color can be chosen to accentuate the mood you desire. Choose bright or dim on the light setting according to your preference. Ideal for combating the stench of cigarette smoke, freshening up the scent of your home, and/or misting therapeutic oil benefits into your home, office, or even the gym or a hotel, this device does it all. We love that it is ultra-quiet so it’s perfect for promoting sleep in your bedroom, your child’s room or your baby’s nursery. Sometimes, you just want it all. 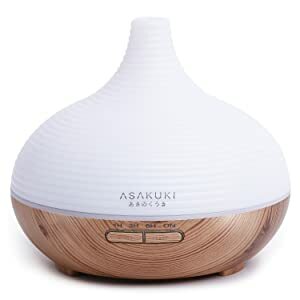 The ASAKUKI 300ML Premium Essential Oil Diffuser delivers exactly that! This multitasker is an aromatic ultrasonic essential oil diffuser and a humidifier all in one. Simply skip adding the essential oil to the water and you can run the cycle as a humidifier to moisten dry air. The tank has a 300 mL capacity and is super easy to clean so you and your family won’t be bothered with dangerous germs that can build up. There are 7 LED light colors that grace the area or, the light option can be declined. The spray modes can be regulated so you control how much mist is distributed. An automatic shut-down feature keeps you safe even if you fall asleep or forget to turn the unit off when you leave home. The materials used in the construction of this device are super safe and top-quality which is a favorite feature. It is covered by a one-year warranty and also by a six-month money back guarantee. This power-packed URPOWER Ultrasonic Diffuser has all the “must have” features like an automatic off switch when the water level runs out, a full 7 color LED light show that can alternate between bright and dim. The light effect can double as a night light too or lul a baby to sleep. The unit is BPA-free so you know it is good for you and never harmful. It holds a capacity of 400 mL of water so you can get comfortable and relax, knowing you won’t have to be getting up for a long time to add water and essential oil. There are two settings you can choose from on the mist control. It is super quiet which makes it ideal for promoting sleep when you use calming essential oils. You can place it in your bedroom, in your child’s room or even in the nursery. Another convenient feature is the auto settings of 1, 3, and 6 hours or, you can let it run until the water depletes and it automatically shuts off. It comes with an adapter and a measuring cup. If you love the classic look of a candle lantern, you’ll adore this InnoGear Iron Cover Ultrasonic Diffuser. The high capacity of 500 mL allow it to run for 12 hours in a continual low misting mode so you don’t have to lift a finger. It features a high and low button option to regulate the strength of mist and has a timer you can set for 1,3, or 6 hours, or, you can opt for it to run continually until the water runs out at which time it will automatically shut off. An LED light enhancement has 7 colors which can be set to dim or to bright, making a total of 14 color variations in all. This unit is very quiet so you can run it while you are sleeping or even use it in the nursery or a child’s room without worrying it will wake anyone. The size of area this diffuser covers is larger than most so your options are even greater. You can place it in a large family area or office common space for all to enjoy. 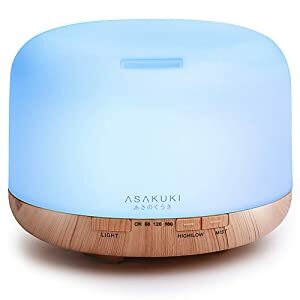 This 500 mL capacity ASAKUKI Premium fragrant oil vaporizer, humidifier, and ultrasonic aromatherapy diffuser is a beast when it comes to filling the air with essential oil or forgoing the oil option for a humidifying effect. It is super easy to keep clean and also boasts a 7 color light show. The mist can be controlled on the settings and the entire unit has a safety auto shut-off feature than turns it off when the water level runs out. This unit is constructed from safe, quality materials and is eco-friendly. It comes with a 100% satisfaction guarantee so you love it, or else… A 6-month money back guarantee is in place and a full year of warranty. When used without oil, it becomes a humidifier which can help with dry skin, dry coughs, respiratory conditions, dry and cracking floors and walls, and a host of other issues caused by excessive dry air. When it comes to filling a medium to large area with the goodness of aromatherapy, you’d be hard pressed to find a better, more reliable unit that is ideal for keeping your home or office smelling great and full of the medicinal benefits of essential oils as well. How would you like to run a diffuser for 20 hours without having to add more water or essential oil? 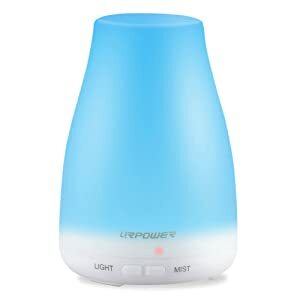 With the URPOWER Square Aromatherapy Essential Oil Diffuser Humidifier, you can. This peppy unit isn’t afraid to square off with the competition. In fact, it IS square. The pleasing aesthetics of the device itself is coupled with the fact that it features 7 calming LED lights that can go through an alternating cycle or, you can choose one color to set the tone for the duration. The lights can be brightened or dimmed or turned off entirely. It boasts an auto-shut which turns the device off when it is out of water. Because the capacity is 700 mL of water (plus essential oil, if desired), it can easily cover a spacious area. Perfect for any room in the house, the office, the classroom, or even for traveling, this device is as multi-functional as they come because it can disperse ample amounts of essential oil infused mist and can be used without oil for moistening dry air as a humidifier. If you are serious about your diffusing and humidifying, this device is perfect because it is squarely all-business with an “out of the box”, unique look and feel. 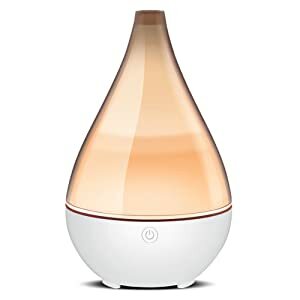 Now that you are able to narrow down your ultrasonic diffuser options with our 15 reviews and recommendations, you’ll want to take your knowledge of essential oils to the next level to ensure you get the most from your device. A world of benefits await you when you learn about the best essential oils use in a diffuser. Keep in mind that when using a diffusing device, you inhale the delightful aroma which means it is actually going into your body. Be sure to exclusively use top quality essential oils that are rated as high grades. Essential oils are powerful. They can change your health, your mood…your life. But, they are only as good as the oil itself and the essential oil diffusing delivery method you use so be sure to choose carefully and make the most of your experience.